Win your own copy of this book! See below for more details. Everyone, it seems, has an idea for a book they think should be made. But how do you go from a good idea to a career in writing? Originally published as Putting Your Passion into Print, this revised edition has a new name and a fresh perspective on the rapidly evolving world of publishing. In The Essential Guide to Getting Your Book Published, Arielle Eckstut and David Henry Sterry present lucid, step-by-step advice to would-be authors, from inception to publicity. Eckstut, an agent, and Sterry, a self-proclaimed “book doctor,” have a great deal of publishing experience between them. They have helped others get published, and they have authored several of their own books. They walk budding authors through the many steps of publishing a book, including how to begin, what to expect once the process is underway, and how to maximize your book to achieve your goal—whether it be riches, fame, or simply the satisfaction of being a published author. The authors begin with the most important step of writing a book: choosing the right idea. Once you have that down, you can move into building an online presence (or “platform”) through a website and social media; finding and landing the best agent for you; perfecting your pitch and proposal; undertaking the submission process; and, because every author is faced with it, dealing with rejection. The authors then address the more businesslike aspects of publishing. They cover how to sell your book to a publisher; negotiate contracts and royalties; manage relationships with your editor/publisher; and, of course, write the damn thing. They also cover self-publishing options in depth. But writing and publishing a book is only half the battle. An excellent bound book in hand is useless if no one knows about it. Therefore, Eckstut and Sterry constantly emphasize the importance of getting the word out. Though they advise that you begin establishing an audience immediately after conceiving of the book, they note that publicity and marketing efforts really need to be in place about six months before publication. Don’t worry, though; they offer advice on everything from how to negotiate special sales to how to appear confident and knowledgeable in an interview. Writing a book is not easy. But it can be incredibly rewarding. After reading a blurb on the back of the book from Timothy Ferris (“I started with nothing but an idea, and then I bought this book”), I was intrigued. I’ve worked in publishing for several years, and I was curious to see how my little world was presented to outsiders. However, I was surprised to find that I was learning a lot; the sections on agents and special sales were enlightening. And much of their advice is useful to any entrepreneur; for example, the chapter on establishing an online identity is useful to me as a book blogger. I particularly enjoyed an anecdote about an author reading with a turnout of only four people… until the cops arrived midway through to arrest three of them. Turns out, they were bank robbers on the lam. The conversational tone and infectious humor of the prose made the content engaging. The layout breaks up otherwise information-dense text; it is peppered with the seasoned advice of booksellers, publishers, authors, publicists, editors… anyone involved with creating and selling books. the word “local” has taken on a whole new meaning. Yes, you can reach anyone, anywhere in the world, but that doesn’t mean you should neglect your own backyard. Cuz if you can’t find love there, it’s going to be hard to find it anywhere. I was especially pleased to see a shout-out to a D.C. literary establishment. In the self-publishing chapter, the authors cite Mark LaFramboise as saying, “We took [a self-published book] because a) the author is local, and b) it’s an interesting and useful subject.” LaFramboise is described as “a buyer at Politics and Prose, D.C.’s famous independent bookstore.” Yeah, that’s right–famous. They’re kind of a big deal. 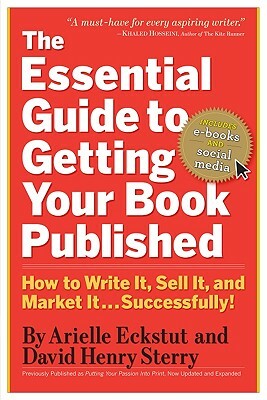 Another noted bookselling figurehead, Michael Powell, commented, “I believe nearly every book that deserves to be published gets published.” And if you follow the advice of the authors of this guide, remembering that getting published is a business and treating it as such, you will deserve to be published. Just leave a comment below or on any post this month to win this great guide! Don’t forget to include your name and email address so I can contact the lucky winner. This contest will close on November 30. Good luck!